I took all of your sweet advice yesterday from the comments and did an awesome interval workout. I got up to a 7.6 mph and was actually feeling pretty good. That 45 min accounts for the first warm up mile, so the average 4 mile run was a little under a 9 min mile. 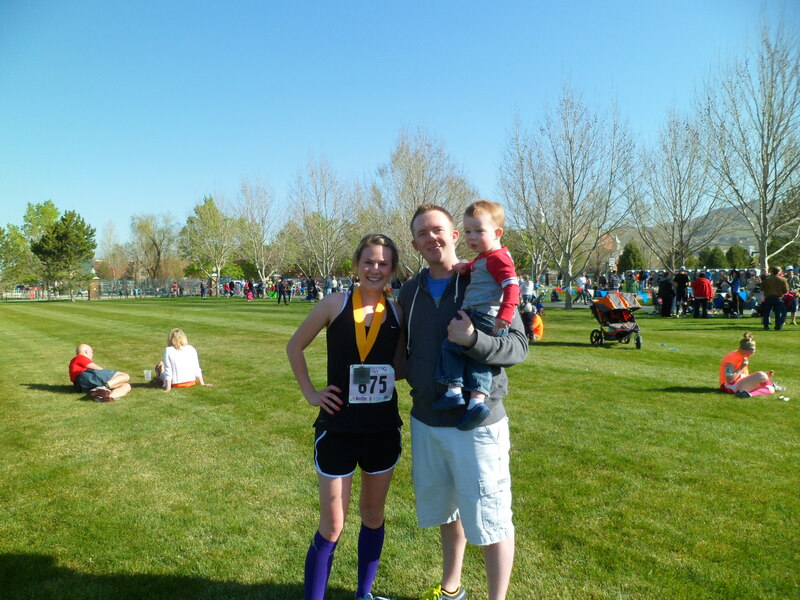 Thanks for all the encouragement, and I look forward to doing more speed workouts that are going to push me. 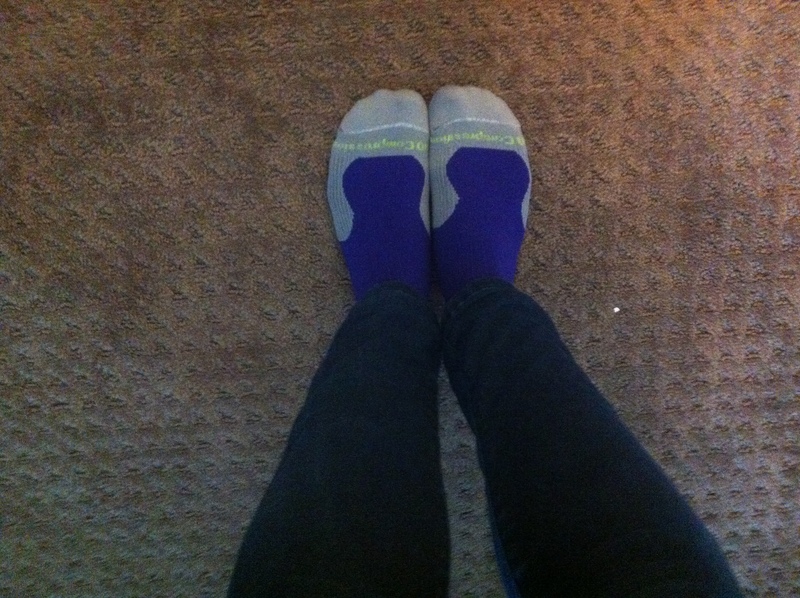 I received a pair of purple Marathon compression socks in the mail about 2.5 weeks ago and I’ve been testing them out ever since. I felt a difference during my half marathon. No really, my legs didn’t feel as tired as they normally do. Mentally, the race was difficult, but legs felt fresh. I even walked around the Tulip Festival for a couple hours feeling fine. The next day after the half marathon I wore them while I took a rest day. I just wore them under my jeans. It felt weird at first because I don’t really like tight things(and they are tight!) around my legs or wrists, like gloves(I know weird). When Monday rolled around I felt ready to run. 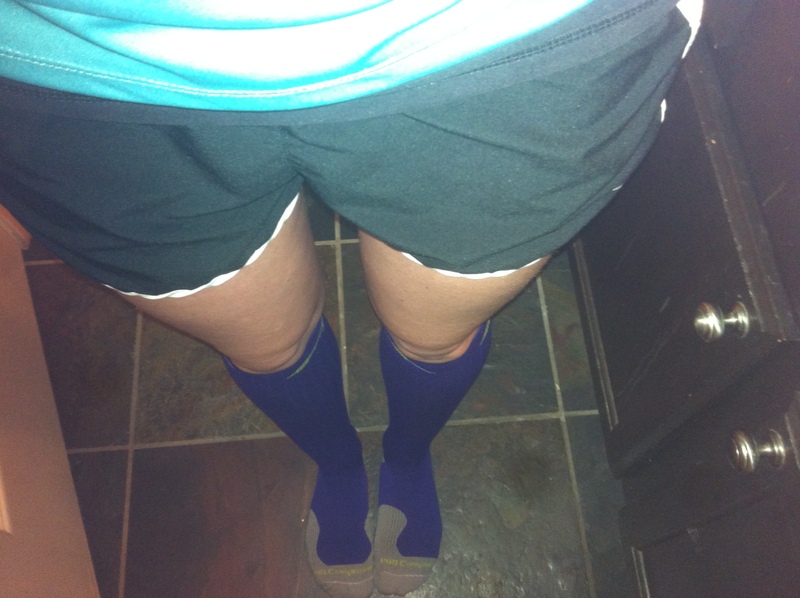 I always do a shake out run the Monday after a race, but I felt more ready to go and not so achy after using the socks. By Tuesday I felt 100%. It usually takes me till about Wed or Thurs and I definitely credit the fast recovery to the socks. I continue to wear them during speed workouts and the day after a hard workout. I’m really liking them! I got a size S/M and they are pretty tight. They’re supposed to be tight, but not uncomfortably so. I don’t have giant calves, so S/M are perfect for my size 7 feet. Handling tips: I hang dry the socks so that they don’t lose their compression or get any smaller. 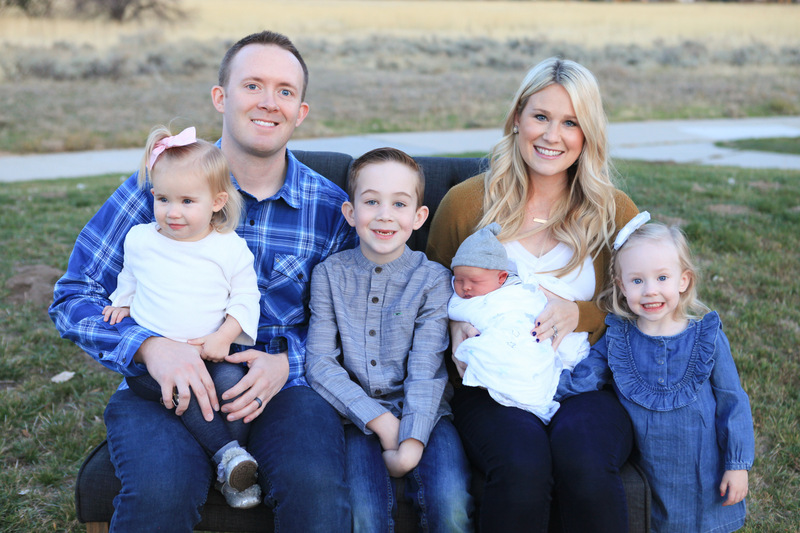 If you want to learn more about the company, see more colors, or find out more on how the compression socks work, visit PRO Compression here. 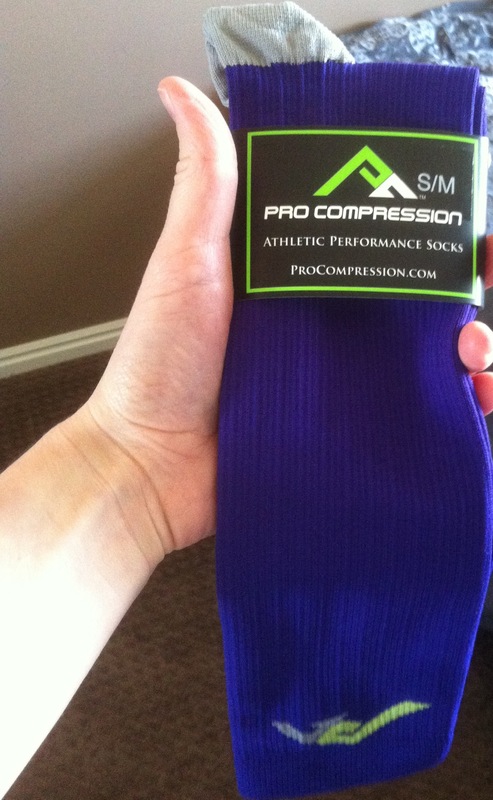 Here’s the awesome part, PRO Compression is giving away 1 pair of Marathon Socks to 1 lucky reader. . .
Tell me(in the comments) what you do to help aid in recovery after a tough run. A winner will be chosen Monday 5/13/13, Good luck!! This entry was posted in Uncategorized and tagged Giveaway, PRO compression, workout. Bookmark the permalink. 57 Responses to PRO Compression Giveaway!! I haven’t tried compression socks, but I’ve heard they’re very effective. Right now, it’s just lots of water and self massaging. I have a whole routine to recovering from injury especially as I’m currently getting over ITBS and recovery/injury prevention is always on my mind these days. 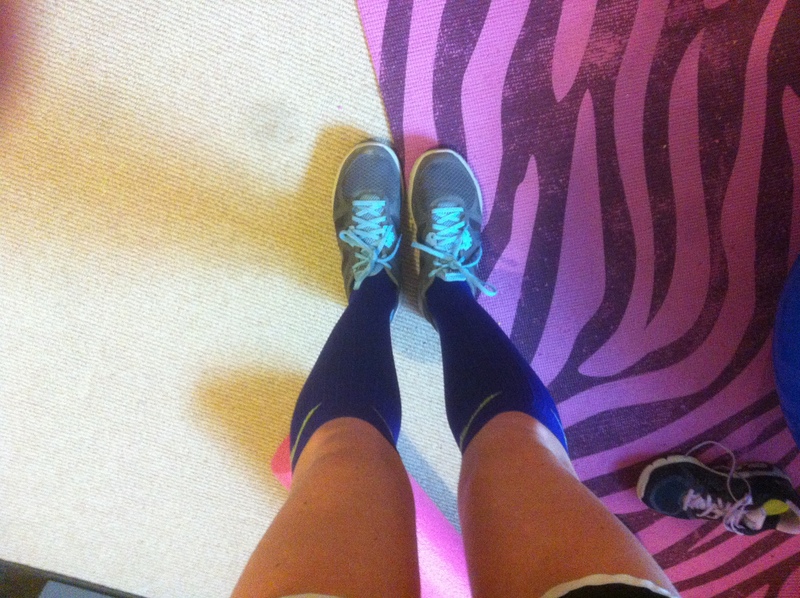 My recovery routine does include compression socks (the one’s I have are specifically recovery oriented) – I usually wear them for a couple of hours after I run/work-out at the gym. I roll my legs out on a foam roller for a minute per muscle at least once a day after my workout (sometimes I’ll also do it when I wake up if I’m really sore/tight that day). I do a bunch of strengthening and flexibility exercises that were prescribed to me by a physical therapist. Sometimes, I’ll ice my knee if I’ve had a flare up on the run (flare ups usually are more uncomfortable and I stop cold turkey if I feel pain) but luckily they are becoming less frequent with each run. All in all, my routine takes about 1.5 hours a day (45 minutes twice a day, once pre run and once post run). I also ‘liked’ PRO Compression on facebook. I drink a big class of Silk dark chocolate almond milk after a hard run and I make sure to stretch a lot (but gently) for the next day or so! I chug a ton of water and have greek yogurt, fruit, and granola for breakfast.